Need some garden mulch? Putting tree mulch on your garden has a range of benefits including putting nutrients back into the soil and also allowing your garden to hold more moisture during dry weather. Tree mulch has two benefits for your garden, the leafy material breaks down quickly, feeding your plants and soil, while the woodier material takes a longer time to decompose, aiding in keeping moisture in the soil and helping prevent weeds from growing. We can deliver garden mulch in bulk so you save! 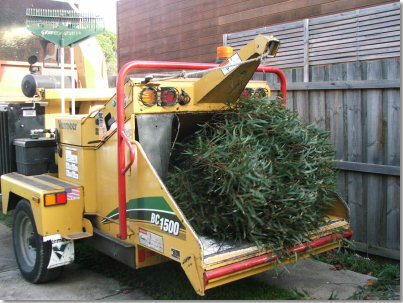 Wayne Barry's Tree Services can clean up and mulch trees and garden waste to keep your garden clean and tidy. We can also take care of any fallen trees and debris after storms and high winds. The mulch can be either left for the customer or taken away. Our mulcher can mulch wood up to 15 inches in diameter and we offer a fast, professional service. Contact us to take care of your garden mulch supplies or for our tree mulching service.